In 1965, Italian artist and designer Bruno Munari created the Tetracono, a 15-cm black steel cube with four aluminum cones that spun at four distinct speeds on a 18-minute cycle. The product’s function was to “show forms while they are in the process of becoming.” Applying Munari’s ideology that “it is not research that should be purposeful, but its results,” designer, educator, and publisher David Reinfurt recently spent six months as a fellow at the American Academy in Rome researching and experimenting with Munari’s product-artwork, unsure of what might follow. Shortly upon his return to New York City, I spoke with Reinfurt about his research and how the Tetracono can act as a model for thinking through larger questions surrounding design, art, and the often grey areas in-between. Over the course of our many conversations, it became clear that Reinfurt’s design research around the Tetracono is not close to finished. He explains, “As long as further digging continues to suggest new making, I will continue.” Already, he has an event planned at the Picture Room in New York City and a lecture at MIT, among other projects. Hi David. What initially lead you to the American Academy in Rome? Did you know from the start that you wanted to focus your research on Munari’s Tetracono? Was it his background as a graphic designer that was most intriguing or rather his overall process of making—be it graphic design, art, industrial design, etc.? I would like to spend six months at the American Academy in Rome imagining, writing, and recording a conversation between Munari and Olivetti. Munari was an artist who made a concerted, ethical shift towards design, while Olivetti was a businessman who switched his focus away from financial gain to imagine a corporation whose cultural obligations were paramount. Both upended the expectations of their respective disciplines and, in the process, expanded what was possible and necessary within them. This imagined dialogue would form the basis of a short video of approximately 20 minutes. 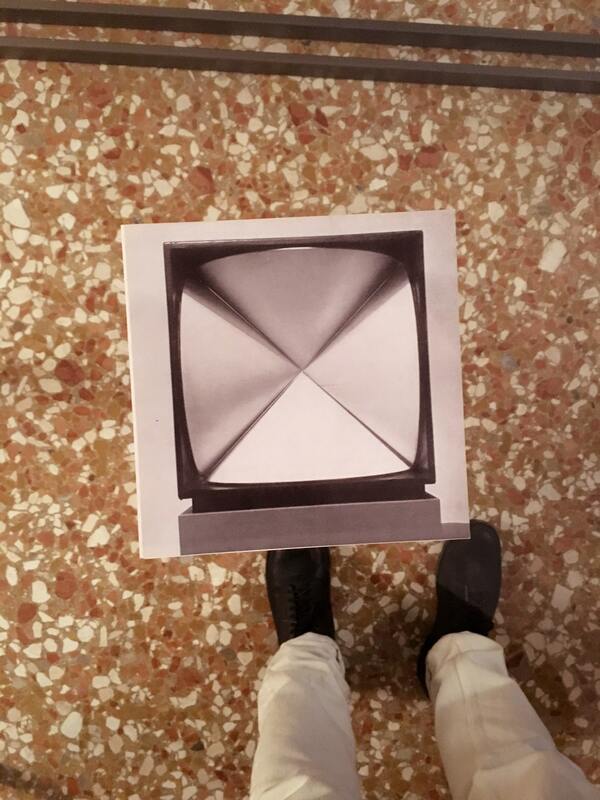 The visual would consist of a real-time shot of Tetracono, a work by Bruno Munari from this period. Tetracono is a product-sized artwork made of four cones, each painted half-red and half-green, and attached to four motors. Each turns at a specific speed, and the resulting image is one very slowly turning composite color which moves from green to red on an 18-minute cycle. The choreography of this transition would be reflected in its accompanying conversation, as Munari and Olivetti discuss and develop how art might jigsaw with industry to produce a cultural dividend. When I arrived in Rome and started looking into Adriano Olivetti, I quickly realized what a sprawling topic he was personally, much less Olivetti as a corporation. It wasn’t immediate, but as I started to work it became clear that what I was most interested in was simply the Tetracono itself. I had previously looked into this work in the context of an article I wrote and published for The Serving Library. This text, “c. 1962” itself evolved from a lengthier investigation which started with Munari’s connection to an exhibition at the Olivetti typewriter showroom in Milan. Arte Programmata was organized by Munari together with Giorgio Soavi of Olivetti and writer Umberto Eco. That show also initiated the use of a novel term, “programmed art,” for constantly variable, often kinetic, art works which although appearing to be random and constantly variable, were in fact, constituted by carefully constructed programs (or plans, scripts, limits, what have you). These works began to appear right around the same time that Olivetti began to manufacture computers. Munari often said, “It is not research that should be purposeful, but its results. In other words, let me play, then we will see.” You seem to have embraced this ideology throughout the course of your research. Have you found this approach useful and/or practical? As all of this was happening I was also well aware of the absurdity or, anyway, the unlikeliness of what I was doing. I think that being aware of that fact also helps me to treat this work as the serious play that it should be. It also encourages a certain kind of looseness that lets the research lead where the research leads, in a more lateral, more freely-associative, or empirical manner. This must be what Munari was suggesting in what you quote. One thing I’ve realized, however, is that in every case, Munari manages to express complicated thoughts in an utterly simple way. Munari was constantly investigating language, whether it was visual or cinematographic. The Tetracono was a sort of programmed art that was based on experimentation and non-subjectivity, in accordance with a scientific method that took account of technical aspects and psychological data concerning perception. You’ve experimented with similar programmed works in the past. What is it about programmed art that you find most interesting? How does it relate to your design practice? Programmed art, aside from potentially being an oxymoron, is also simply fruitful for me to think about. It must be the tension that it holds in place between what appears to be a random sequence of events and the underlying script that directs the action and defines its limits. This controlled play resonates with me, and perhaps that is specific to my orientation as a designer. Long ago I drank the designer Kool Aid that suggests that *limits (constraints) are also opportunities* and that embracing these can make work that is inevitably more alive. I need these checks, and when left without, I can’t make work. When these are not directly in the situation or problem, I end up either inserting or inventing them. So programmed art connects with my disposition. In Design as Art (1966), Munari described the Tetracono as “object produced on a small scale for the purposes of programmed art.” So, in a way you can imagine that the product-artwork is also something of a tool for thinking about programmed art. The Tetracono’s double status as an object and a tool is compelling. You describe this project as “design research.” What constitutes design research today? How to design (multiples) … Multiples are designed with the methods of research. Unlike the artist, the designer does not make a wonderful sketch and later find some reproduction technique. He experiments on a phenomenon which is optical, physical, geometrical, typological, mechanical … He refines the elements of communication, and studies the best material with which to produce the object for the maximum level of visual communication and the minimum level of cost. He finds the mechanical technique which best suits his purposes, and in the end a prototype is born — not a unique artistic creation, but a model for the creation of a series. Reproductions of artwork are always inferior to the original, but when designing a model for mass production, the prototype is always inferior to the final products. Of course that was then and this is now, 50 years later. I described my project as design research, and for me that simply meant that it was compound. Yes, it is a research project and, yes, it is a design project. In this case, it was a combination of historical digging as I attempted to learn more about the object and its context while working in parallel actively making objects, graphics, software. Building the paper model led me to deeper research around the Tetracono’s geometry and where it originated. Turns out, surprisingly, there is a concrete answer. As these things go, Rob Giampietro introduced me to Davide Fornari. Davide was very helpful in connecting me with people around this research. He has a previous deep interest in Arte Programmata and organized a project including an exhibition, workshops, a catalog, and a comprehensive website here. Davide arranged and facilitated an interview with Giovanni Anceschi. Anceschi showed it to Munari who was excited (as was Anceschi). From that image, Anceschi imagined a cube with six cones each protruding from one face of the cube. Each cone would be created by the circular rotation of a single bent wire. He called it the “Esacono” (6 cones). Turns out it wasn’t feasible to build the idea. Munari, however, simply shaved off two cones, changed the prefix from “esa” (6) to “tetra” (4), pointed them inwards, and merged this essential geometric insight with his simultaneous interest in programmed art. The resulting mashup, an inside-out, kinetic Conosphere, is the Tetracono. Now my “research” evolved in a distinctly cyclical fashion and led me to the manufacturer and seller of the Tetracono. Danese Milano started as a small “design gallery” and worked with Munari intensely from the beginning, designing products, multiples, graphics, prints, even choosing what other artists and designers Danese should represent, designing the showroom, and staging exhibitions. It was in the Fondazione Jacqueline Vodoz e Bruno Danese (which houses the archives of Danese Milano) that I found the original of that Tetracono construction drawing. In the interview with Anceschi, I found out that the Tetracono was even manufactured in the Gruppo T studio that Anceschi shared with Davide Boriani. There was no real drawing, but rather the size and form was verbally communicated by Munari to a lathe operator in the studio. As far as I can tell it was made without proper drawings; the drawing I was working from was most likely made after the fact as more of an illustrative diagram. Anyway, all very circular. Time, or work that plays out over time, is a recurring theme in your work. Why is time and working in cycles so important to your practice? How does it relate to Munari and his process? Anyway, for me it is a kind of circling around a core of concerns. These interests change depending on if I’m working with other people, or in some unique context and it might be a boozier walk that strays farther from the center. Eventually I seem to stumble back to my central ideas. Cycles are less an aesthetic preference and more simply, a consequence of keeping things moving. And for thinking about cycles, I could hardly ask for a better model than the Tetracono. In a recent lecture, you describe the Tetracono as a useless, yet important, piece of work. Can you elaborate? I don’t see a contradiction between useless and important. If you take the idea that art is distinguished by its uselessness, then a work’s importance can be multiplied by its uselessness. While in Rome, you discovered that one of Munari’s restored Tetraconos was not functioning according to his design. How did setting back the work to its original intent impact the remainder of your research? First, I should say that there are two versions of the Tetracono. The first one was 20 x 20 cm, made in an edition of 10, with motors. The second was smaller (15 cm), made in a run of 50 copies, and without motors. The motors in the first edition never mechanically worked very well, and the product was too expensive. It was a commercial flop, if a conceptual thunderbolt. The second edition, called Tetracono SM (“SM” stands for senza motore, or “without motors”), worked a bit better as a product, although the fact that it didn’t move seems to contradict what I like so much about it. I’m ok with that. About four months into this work I returned to the Fondazione Jacqueline Vodoz e Bruno Danese in Milan. They had a working version of the original motorized Tetracono as well as a Tetracono SM. I had never seen one in movement up to this point, but had studied its patterns on paper, and prototyped it in software as a screensaver. I was excited to see a real one move. Manuela Cirino met me at the foundation and pulled down the boxes down from the shelf. Then we proceeded to look around for the power cable which was missing, of course. We never found it that day, which is too bad as I was very excited to see this thing moving for the first time. Well, after I left, riding on the train back to Rome, Manuela found the cable, plugged it in, and the Tetracono began to move. She shot a quick video on her phone and texted it to me; I got it on the train. Immediately I saw the rates for it were off and even one of the cones was spinning in the wrong direction! Turns out it worked and then was renovated in order to be shown at the Museo del Novecento in 2005. Something was wrong. Has reincarnating the Tetracono brought to light the grey areas between art and design? I like the idea of “reincarnating”! That’s certainly a cycle … Anyway, yes, throughout this research, I have been wading through the grey areas. In addition to the cyclical patterning of the Tetracono, I was also drawn in by its status as something between and artwork and a product. The story goes that Bruno Danese was already running a successful “design gallery” in Milan selling handmade ceramics and other one-offs when he approached Munari in 1957 to do something with him. Munari responded by saying he would only if it was an industrially produced product, insisting that this was the only real contemporary option. Munari designed and Danese produced and sold the Cubo ashtray that same year. It was also a commercial failure at first, but Danese persisted and it is still manufactured 50 years later. I bought one in May, and on the package it says, “Is this perhaps a classic?”! Yes, clearly. Serial production is not reproduction. Reproduction implies that there is an original ‘unique piece’ which, as such, cannot be reproduced, but which production techniques try to imitate as closely as possible. Therefore the reproduction is always inferior to the original, and its main function is documentation. On the other hand, production uses the techniques which are available to the artist today to manufacture a given number of pieces (not copies), without the existence of an original, which can be the same or slightly different, depending on the methods of production, design, planning, etc. […] The number of pieces produced varies according to the techniques and the subjects involved, from a minimum of fifty, to an unlimited number in order to obtain more reasonable prices. Only those who mistake price for value are not interested in this type of production. In your opinion, what is the difference between art and design? Design and innovation? Well, to take the last part first—I am pretty sure that “innovation” is mostly a lazy synonym for design which, most often anyway, ignores the rigor, process, and research aspects of design. “Innovation” is a shiny word, and it is telling that it also implies (and incorporates in its linguistic roots) newness. I hardly think that newness is a useful criteria where design is involved. Newness is great if we are talking about yogurt at the supermarket, but I think it ends there. This sounds more emphatic than I mean it, I’d guess. The word “innovation” is not dangerous; it is just unfortunate when it erases “design.” Design is something else more intentional, deliberate, sometimes slower. Innovation assumes an end that is new, disruptive, whereas a design process might and often does end in the decision to do nothing. I’ll leave the art and design question permanently suspended. I completely agree! Over the course of your graphic design career, you seem to have embraced the notion of using situations as they happen to make new work. What new work will come as a result of your time in Rome? 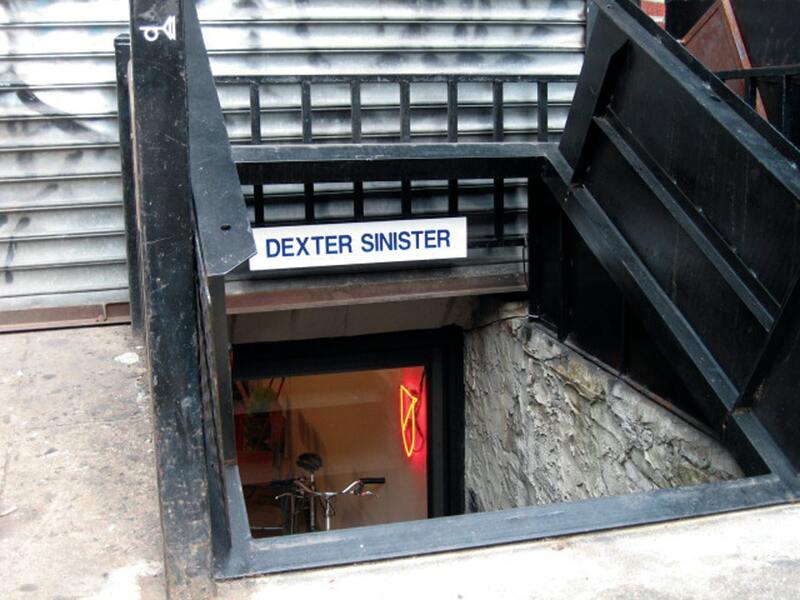 I think it was five years ago, Stuart and I (as Dexter Sinister) were contacted by COLLI Independent, a gallery, bookstore, and publishing platform in Rome. COLLI asked us to design a poster for an exhibition and we contributed a work called Watchscan 1200dpi. The original image, commissioned for a previous invitation, was made by taking a very high resolution scan of my wristwatch. At 1200 dpi, the scanner head moves more slowly than the second hand and so it appears to bend in the resulting image. Red, green, and blue passes of the scanner even register if you look closely. But then a better idea appeared to combine all four moments of the Tetracono in one print, making a kind of “time sandwich.” Four-color silkscreen printing requires four-color separations (cyan, magenta, yellow, black) overprinted to produce the full-color image. So we took the cyan plate from one image, magenta from the next, yellow from the next, and black from the last. Each of the four plates was from one point evenly spaced in the Tetracono’s 18-minute cycle. Because silkscreen prints one color at a time, then the image would build up over the printing time and we had no real idea what the result would be. David will be presenting research and work from his six-month residency at the American Academy in Rome on Friday, September 29 at the Picture Room in NYC and Friday, October 20 at MIT.